The presence of magic has had two effects on the development of science and technology. It makes it MUCH easier to test things and to sort out what’s going on on an immediate, local, level. You want to look at something very small? A simple charm will do it. Rough spots in a prototype, minor repairs, and the need for precision craftsmanship can all be easily glossed over with simple spells. It also means that a lot of talent is diverted into magic – and magical talents are both inherently limited and die with their user. An engineer who uses a small spell to get past a small hurdle in his design may produce a device that works beautifully, but which will be almost impossible to duplicate without equal magical talents and a through understanding of how it’s supposed to work. A “mad scientist”, who builds devices to help channel and amplify magic, may well create “technologies” that no one else can duplicate and few can use. Pulled by those two opposing tendencies, the technological development of Verdan has followed the same general course as Earths – but with rather a lot of minor differences. Naturally enough, the place to start off a look at technology is almost always with power sources. While wind, water, and muscle power fulfill their ancient roles, the driving force behind the industrial revolution on Verdan is steam, just as it was on Earth. 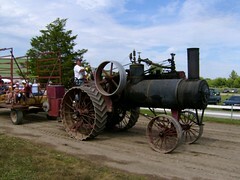 The Steam Engine is the true technological marvel of Verdan; a well-designed steam engine has few moving parts, will function at high efficiency on fuels ranging from wood and coal to paraffin and oil (or, for that matter, on geothermal heat, nuclear energy, or solar power), and requires no wiring or electricity. Thanks to the steam reservoir of the boiler, it provides near-constant power throughout each cycle, rather than the series of explosive kicks provided by an internal combustion engine. Its internal systems are not subjected to those kicks, to superheating, or to corrosive combustion products – and so tend to require far less maintenance than an internal combustion engine. This, of course, is why virtually all commercial power plants use steam engines (usually the Steam Turbine variant) even today. There’s always a price of course. Maintaining clean, efficient, combustion requires a reasonably large firebox – and maintaining pressure requires a sizeable boiler and a sizeable tank of water. A heat-sink and condenser system – to avoid having to keep adding water – bulks things up even more. Unlike an internal combustion engine, it takes time to build pressure and start a steam engine. Also unlike an internal combustion engine, the boiler and piping needs to he able to withstand high pressure as well as the engine block. Steam Engines are powerful, efficient, and versatile. They are also large, heavy, and slow to start. There are a few experimental steam cars and steam tractors are available for larger farms – but personal transport (barring the tinkerings of mad scientists and magicians) is still mostly limited to horses and carriages. For all the wonders of the industrial age, the burden of supporting civilization continues to rest on the hardworking shoulders of the humble plowbeasts of rural farmers, and likely will for many years to come. In many cities steam also provides supplies of running water and pressurized air – used to run a wide variety of small-scale mechanical devices, to speed message-tubes from place to place, to feed small high-temperature furnaces, and for many other purposes. Unfortunately while such a system is remarkably safe and convenient in many ways, it’s difficult to scale up and provides fairly limited amounts of power. Still, if you need more power than that, that’s what Steam Engines are for. Electricity is known and many of it’s basic properties are understood – but it’s primarily the domain of tinkerers, inventors, and mystics who claim that it’s somehow related to Lux. While there are crude generators and electrical motors of various kinds available, at least as many experimenters rely on various types of batteries. The wildest tinkerers rely on “Lightning Bottles” – basically Leyden Jars constructed of Lux-charged alchemical materials and augmented with a few minor spells so as to be quite literally capable of storing lightning bolts – which is, of course, the only way to really get them fully charged; current generators would take weeks to produce that kind of power and are quite incapable of reaching such voltages. Occasional inventors try to combine Lightning Bottles with various forms of electrical propulsion to create personal vehicles – although such attempts to “ride the lightning” are often incredibly dangerous to operate. Most cities ban such things within their limits; when some foolish tinkerer crashes their new electric “motorcycle” with it’s dual-lightning-bottle power supply into a building at a hundred and fifty miles per hour the casualties are rarely limited to the inventor. For references sake, a fully-charged Lightning Bottle contains about as much energy as two gallons of gasoline or roughly 100 kilograms of TNT – although it can generally be used in a considerably more efficient manner. Lightning Bottles make relatively poor warheads; while they can blow up a laboratory quite effectively, detonating one expends most of their energy as light, melting of their structure, a modest electromagnetic pulse (which will probably pass undetected), and heating of the surrounding area. As far as powering electrical equipment goes, a Lightning Bottle is about equivalent to a full tank of gas in your car. The most practical use of electricity (unless you count the speculative “cures” offered by the purveyors of electrical shock treatments and “animal magnetism”) so far is the telegraph – which is in fairly widespread use. There is, however, little call for major generators and electrification projects; light spells are one of the simplest and easiest of all magics, and are used in almost every home and business. Chemical explosives – most often in the form of gunpowder, dynamite, or nitroglycerin – are in widespread use. With applications in mining, construction, demolitions, road-cutting, and war (among many others), the availability of standardized, reliable, explosives have revolutionized a hundred fields, ranging from archeology to warfare. They make it possible to move vast quantities of stone, to clear away rubble, to open routes to hidden locations – and, of course, to either shoot individuals or to blow people up in large groups. In many ways, explosives are steams compliment; like steam, they place enormous concentrations of force and energy in the hands of their users, like steam they allow works to be accomplished in moments that would take months of hard labor otherwise – and, like steam, they can be exceedingly dangerous to work with. Armored trains, on the other hand, have proven relatively ineffectual in military affairs; it’s just too easy to tear up the tracks. This has led to attempts to provide armored trains with various forms of treads or recirculating tracks – most of which have turned out to be depressingly easy to jam/so heavy that they bog down/nigh-impossible to turn. The success of such efforts has been relatively limited so far, save for one or two unusual engagements along the border of Germany and France.